Do you have a house you want to sell? If you’re like most people, you want to avoid the headaches, delays, and a hassles that you associate with a typical real estate transaction. There’s a better way! 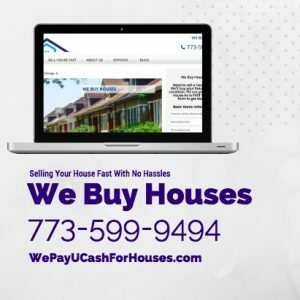 We Buy Houses Fast Chicago provides alternatives and solutions to home sellers like you looking for a simpler hassle-free way to sell. We’re investors and we buy houses in any condition in any situation you can imagine! So if you’re thinking, “How do we buy houses companies work” or “How do I sell my house fast Chicago,” Here’s how we buy houses in Chicago. Once our walkthrough is complete we will give you our cash offer well offer the most cash we can for your property in as is condition. You won’t need to make any repairs or clean up the yard. You are under no obligation to accept our offer and it’s guaranteed for 7 days. We understand that selling your home can be a very overwhelming and intimidating process. Not only is it a big financial decision, it can be a big life change as well so we’re here to make that process as easy and as seamless as possible. A lot of homeowners don’t realize the costs associated with selling their house. Selling the typical single-family home can cost anywhere from eight to twelve percent of the sales price of a house. These consist of realtor commissions, title fees, closing costs, and possible expensive repairs. Not only is the process expensive it can also be very time-consuming and stressful as well so this is where, our company, as local house buyers, comes in. We want every deal to be a win-win situation for everyone. For us, when we buy houses, we do one of two things. We either keep them as long-term rentals in our real estate portfolio or we fix them up and place them back on the market for resale so a loan buyer can purchase them. We like buying these homes because it allows us to help homeowners and sellers out of a bad situation and really they can start over fresh. It’s really like a new beginning for most sellers. Our goal is for you to have a worry-free closing on your property. With our well-earned reputation of being reliable and secure-which is based on hundreds of transactions in the past 6 years-you can be confident when you sell to our local house buyer company-that’s how we buy houses.